interference from civil authorities in church matters. The people of Denholm built their new church with money they raised themselves on a site made available by the Laird, the Earl of Douglas, who was presumably pleased to support the new Free Church because it defied the Established Church – which his family had long opposed. Some of the stones were collected by the village women from the river, and rough undressed stonework can still be seen in a section of the north wall near the entrance to the Pitt Memorial Hall. The Hall was built in 1892 in memory of the Rev. Thomas Pitt who died in service as minister. Two of the longest serving ministers were the Rev. James McClymont who held office for 40 years from 1847 to 1886 and the Rev. John Smith who was minister for 36 years from 1892 until his death in 1928. The United Free Church (as it became known in 1900) was known locally as the Kirk. Chapel and Kirk appear to have coexisted well until the Chapel finally closed in the 1920’s. On alternate Sundays the Independent congregation would worship at the Kirk and their Preacher, William Ramsay, also served as an elder and seat rent officer for the Kirk. The United Free Church in Denholm rejoined the Established Church, now the Church of Scotland, in 1929 under the Presbytery of Jedburgh. But some who had been in the habit of traveling to Cavers or Minto continued to do so throughout the 1930’s. In 1963 it was linked with the Parish of Bedrule and in 1975 with Minto. 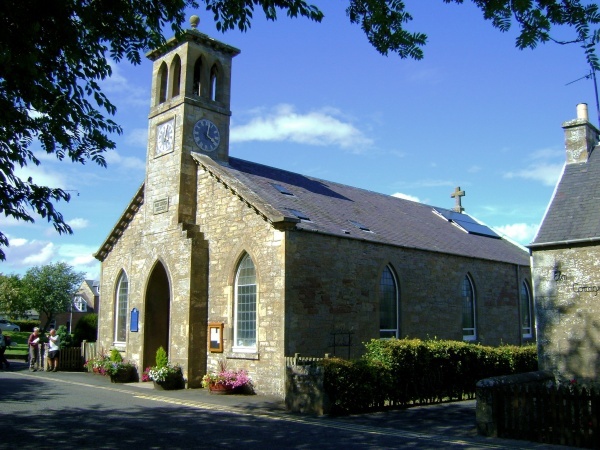 There is a fascinating website dedicated the local history of Denholm Village.